The Columbia River Get-A-Way Driver is a tough, versatile multi-tool that packs a huge amount of functionality into a compact, portable design. 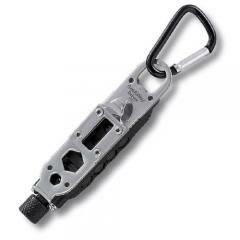 Its carabiner makes it easy to take with you wherever you go, attached to a bag or belt loop. It features a hex bit screwdriver, and comes with two flat and two Phillips heads to tackle almost any set of screws as well as an adapter that turns it into an angle driver. Its spring-loaded ball detent holds the head securely inside the bit. The tool also features a specialized oxygen bottle wrench and a pry bar that makes short work of bottle and jar lids, plus a bright LED flashlight.